Happy Memorial Day blog friends!! A lot of exciting things have been happening and I wanted to share it with you. As many of you know, I love the 1950s-1960s and but what you may not know is that I have a real affinity for clothing of the 1950s. The 50s lifestyle; the values of yester-year where family, a glamorous wife, a handsome husband, and a beautiful home that was stylishly decorated and hearty dinners were served every day of the week all while wearing a beautiful dress, and having hair and makeup all done up. Wearing beautiful pinup girl dresses that have just the right cut and style to enhance women’s curves beautifully. That magnificent cat-eye winged eyeliner and vintage victory roll hairstyles. I am embracing the fashions, and have been wearing my vintage style circle skirts, pinup dresses, wiggle dresses, cardigans, and lovely stockings and heels. At first I wasn’t quite sure how to incorporate my new pinup girl look into the office atmosphere as my curvy figure in a wiggle dress (think more Joan Harris from Mad Men) or a pencil skirt and conservative though form fitting blouse would be way too much, I have been able to wear some pretty circle skirts with a blouse or cardigan and also some dresses. It does take a little more time getting ready for work in the morning especially when adding the vintage makeup touches of a cat-eye and putting on stockings and heels but I have to tell you that it feels fantastic! I feel pretty and feminine and proud to go to work. My former style was a pair of pants with a causal work appropriate top or sweater, and though I always put on my face and did my hair, wearing 50s pinup style dresses and skirts with heels just makes you feel so pretty. I also put my hair in a simple up-do or when my curly hair cooperates, I can pin the front and sides up a little to form a mini victory roll look. I am not quite ready for pin curls and curlers yet but stay tuned! I have also received so many compliments from female co-workers that want to know where I am getting my clothes. I work from home on occasion and love cooking dinner for my husband and I get my self all dolled up in a pretty pinup dress with petticoat for additional flair (think Betty Draper from Mad Men) who was prim and proper, looked so pretty in her 50s dresses that nipped in at the wait and were so flirty with the petticoats underneath. The twirling these dresses make you want to do – oh my!! Weekends are my favorite time as I can wear my fun pinup girl or swing dresses that are really curve hugging and enhancing!! I add a vintage handbag, sometimes a vintage chiffon scarf and of course the eyes and hair are all done up. 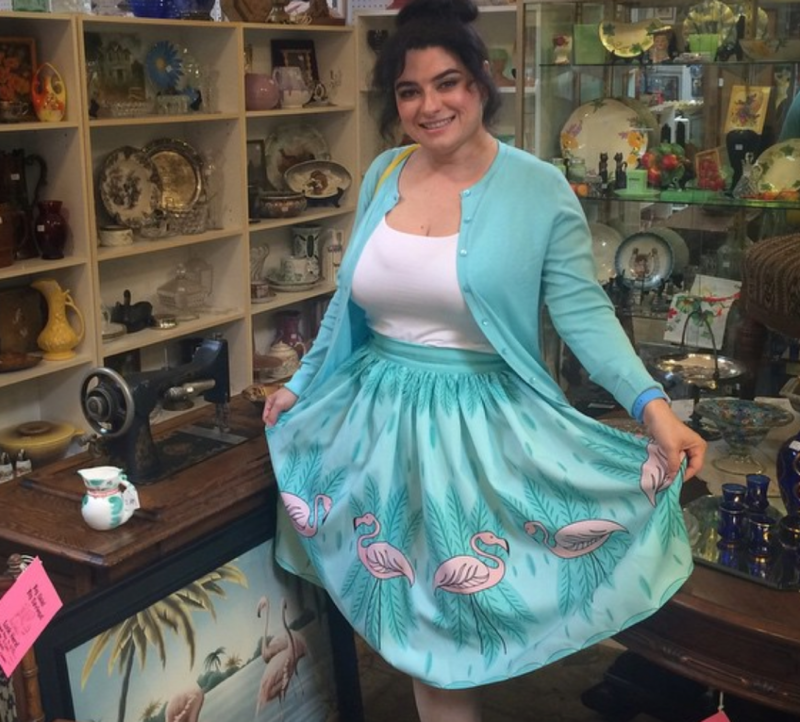 I love wearing this look to the antique fairs and shows and when out at the antique and collectible shops. I have so much fun, the dresses are really comfortable while enhancing all my curves and I receive so many compliments. I’m loving my classic pinup girl look! My husband is so sweet and supportive and tells me how pretty I am!! We moved into our house about six months ago and just got the backyard all done so we can now relax in the beautiful California wine country mornings and evenings. We are still working on the interior as far as decorating and picked up some fabulous mid-century modern lighting fixtures to include a spectacular Sputnik lamp that will go in the dining room, a turquoise blue with boomerang cut-out pendant lamp, a rare Herman Miller desk lamp and a really amazing mid-century modern turquoise planter (I just had to have it). Next up is adding two chairs to the living room and then I will post up some pics for you all. I have a professional pinup girl photo-shoot coming up in a couple weeks and I will share the pics with you all. I am really excited and looking forward to it!! For now, you can keep up with me fashion looks and trials on my Instagram Crazy4Me feed and I am re-stocking my Ebay and Etsy stores with lots of vintage, retro, and mid-century modern collectibles as well as I will be adding vintage clothing and accessories. Hope you are all doing great, please send me a note, let me know what you are up to and if you are embracing the 50s-60s lifestyle and pinup girl fashions? ?